Click here to view historic sales data for Fountain Valley. Scroll down to view the latest listings in Fountain Valley. Fountain Valley stretches about twenty miles south of Colorado Springs along I-25 and includes the subdivision of Security-Widefield and the city of Fountain. From new home builds to well-established neighborhoods, Fountain Valley provides a wealth of amenities and easy access to the entire Front Range region. Households of every size can find unique homes at the right price across the community. 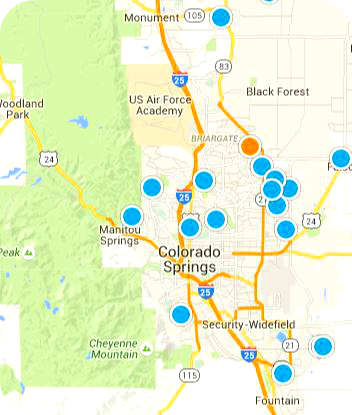 Security-Widefield sits at the northern edge of Fountain Valley. While not officially a separate city from Colorado Springs, these communities function as their own area and offer everything needed for modern living. A few points of interest include Venetucci Farm, where the original farmers of the area are honored through a pumpkins for kids giveaway and educational event each year. Bluestem Prairie Open Space offers 650 acres of prairie grassland and wildlife viewing all around Big Johnson Reservoir. Although the reservoir is currently drained, a 4.7 mile trail extends around it and is open year-round. Churches, specialty stores, and restaurants line Highway 87 as it passes through Security-Widefield, and anything not available is just a short drive away up I-25 or Powers Boulevard. The city of Fountain, just south of Security-Widefield, was incorporated in 1903 and remains one of the oldest towns in the Pikes Peak region. The history of Fountain can be explored through a walking tour or a visit to the Fountain Valley Historical Society Museum. Fountain Creek Regional Park follows Fountain Creek between Colorado Springs and Fountain and features a Nature Center, reservable pavilion, and acres of trails. Aga Park, another popular park in the neighborhood, includes a free splash pad that operates all summer to help the kids cool down. Just south of the city, the Pikes Peak International Raceway claims to have the fastest one mile paved oval in the world and hosts events almost all year long. There are plenty of everyday shops and services available throughout the area, as well. Fountain provides a wealth of options and activities, making it a steadily growing area each and every year. The students of Fountain Valley have been given several options for schooling. Fountain-Fort Carson School District 8 takes priority for all ages of students in the city of Fountain and in Fort Carson, located just west across I-25 from the city. Widefield School District 3 serves the students in Security-Widefield, offering full K-12 education, also. Fountain Valley School of Colorado provides college-preparatory boarding school or regularly scheduled school without living accomodations. Each of these options are great opportunities for the advancement of students' futures.